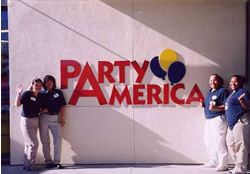 Party America franchise for sale. Free Party America party store retailer franchise information. Party America is the recognized merchandising and store operations leader in our industry, having won the "Best Party Retailer of the Year" for 2004 and the "Most Innovative Balloon Merchandising Award" for 2004 and 2005 at the National Party Retailing Awards in Chicago. Join the Party America team, the growth leader in the retail party supply industry. Party America has established a successful track record that leads all competitors, with six consecutive years of accelerated sales, profits and growth. Franchisees have the opportunity to learn from the industry leaders. Party Supply Industry: Take part in the 11 billion dollar a year party supply industry where competition is low compared to other industries. Our business is driven by a universal love of parties and entertaining; disposable products; strong and dramatic seasonal growth (witness the strength of Halloween and the growing demand for luau and Mardi Gras) and the ongoing special events in our lives such as birthdays, weddings and showers. Consistent Management Team: The Party America management team has been in place since 1996. Successful Business Model: The Party America business model has had a stunning record of success and our financials rival all of our competitors. Our company enjoys high margins based on economies of scale and a successful import program. Reputation: Customer relationship skills, clean, well-merchandised stores, a national presence and brand name recognition all combine to ensure customer loyalty. Philosophy And Culture: Although we are in the party supply business, we are really in the "people" business. Our success depends on the quality of our relationships with our customers, vendors, employees, as well as the communities in which we conduct our business. Financial: Party America is listed with the SBA Registry whose franchisees enjoy the benefits of a streamlined review process for SBA loan applications. Real Estate: Location matters and our conservative development strategy seeks "A" locations only. Party America stores are located in power centers with high-traffic counts and specific demographic requirements. Construction And Design: Party America stores are colorful, fun, clean and inviting, and designed for a superior shopping experience. Our proven store designs can be customized to adapt to specific size requirements. We provide building specifications, letter of intent, as well as sourcing of our custom fixtures at our cost. Computer Systems: Our Retail Information System is a state - of - the - art software and hardware system used in all Party America stores. It collects and tracks sales, inventory, transaction information, payroll, cash reports and provides for efficient replenishment. It includes an ordering system, touch-screen panels and electronic scanning cash registers. Training: A comprehensive training program is provided on the operation, merchandising and management of a Party America store. Manuals are included. Merchandising: An expert corporate team supplies franchisees with detailed product placement diagrams and specific updated merchandising techniques. Inventory: Work with the top vendors and enjoy our same discounts. The Party America franchisee benefits from the volume buying power of the chain. We provide the merchandise selection and planned merchandise-ordering information complete with pre-negotiated terms. Operations: Franchisees receive regularly updated comprehensive operations procedures used in all Party America stores. Twenty-four hour access to Party America's Intranet allows the franchisee to stay current with programs, procedures, forms and training manuals. Advertising And Marketing: Party America provides various forms of advertising ranging from broadcast and print media, store posters to point-of-sale signage. We provide public relations campaigns, advertising and promotion materials and local market print fulfillment programs with full-service direct mail capability. Resources: Franchisees enjoy full privileges to the Intranet, company subsidized annual retreats with management, vendors and field managers. A Franchisee based Advisory Council meets quarterly with each other and Party America management. A love of retail and a passionate commitment to customer service. A willingness to work hard, maintain a positive outlook and desire to be prosperous. The ability to meet the financial responsibilities that come with establishing, operating and growing your own business. A desire to be your own boss. Proven success and experience in an entrepreneurial or retail management environment in the last 10 years. A proven record of high operational standards. Aligning with our proven business model, core values and business philosophy. A full-time commitment to building and developing the Party America franchise business. To learn more about the Party America franchise opportunity, simply complete the form below.